We went in search of more canning tomatoes yesterday and it gives my heart a thrill (to paraphrase Anne of a certain green gabled house) to know that we didn't have to go very far. I think it's less than half a mile to the Anderson Family Farm Stand. 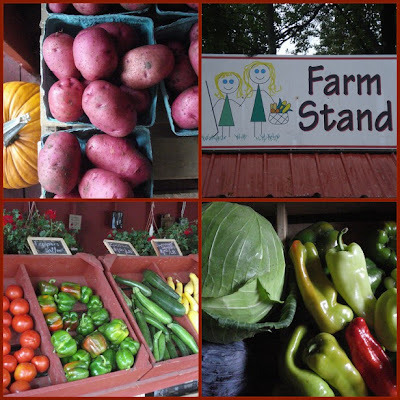 This family farms in a nearby town and brings in their produce for sale here in our beach community. My guess is that it travels less than thirty miles. We always find wonderful veggies and fruit. Yesterday we found cabbages bigger than our heads, onions the size of softballs, yellow and red potatoes, giant red peppers, purple and green basil, melons, corn, squash, cukes...and those twenty pounds of canning tomatoes, of course. We filled three giant cloth bags and spent $40! I know I'd never be able to buy that much produce at the store for that little, and it would never be anywhere near as fresh, delicious or sustainable as the farm stand's produce is. We made one more stop for more canning jars and when we arrived home, Alex went straight to work canning those gorgeous tomatoes. We now have eight more quarts of local tomato sauce in our pantry (along with all the other quarts he's canned up, plus he canned up some more blackberry jam, crabapple jelly and made more cranberry sauce.) Yum. A full pantry of local goodies is a beautiful thing. Thanks, Alex, for doing all of that work yesterday. Reading back through your blog to catch up!! Looks like we have much in common. Lovely photos!